JOHN FORSTER began writing and performing his unique brand of musical theatre and satire as an undergraduate at Harvard, where he founded the long-running revue "The Proposition" and wrote for the Hasty Pudding. His critically acclaimed first solo album, "Entering Marion", was released in 1994 on Philo/Rounder Records and won a NAIRD Award (the "Independents' Grammies".) He's written and produced for the Olsen Twins (on BMG and Warner Vision) and Rosenshontz (Lightyear/BMG). 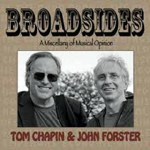 John also won FOUR Grammy Awards for his work with Tom Chapin! Now all that sounds pretty classy to all of us here at Picklehead. But all we know is that when we first heard John's songs, we knew he was a perfect fit for us. We listen to his witty songs here at the Picklehead Mansion, and we know you're gonna love this guy. standardized testing in the schools, lab testing on mice, and many more. Great stuff! !